Aren't these reindeer just so cute? I had to buy this set this year since I didn't have anything like it! I'm still trying to finish posting all the fun holiday cards we made this year. Just a few more left after this one (LOL). Using Chocolate Chip Classic Ink, ink the Santa's Lineup jumbo wheel (roll it over the ink pad several times to be sure the wheel is covered). Then roll once across card front. Ink wheel again and roll a 2nd time to complete the card front. 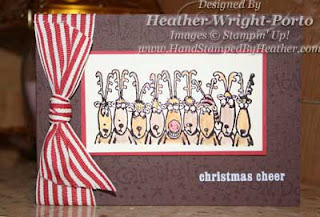 Using Chocolate Chip Craft Ink, stamp the Reindeer (from Holiday Lineup set) on the Very Vanilla piece of paper. Cover with clear embossing powder and heat with heat gun. Then color in the reindeer as desired using the Watercolor Pencils and blender pen. Adhere Vanilla paper to Riding Hood Red paper. Then adhere that panel to the cardfront using Stampin' Dimensionals (one in each corner). Find a holiday saying from the Chit Chat rub-ons and place greeting where desired. I put "Christmas Cheer" in the bottom, left corner area. Then tie the ribbon around the card front and knot in the middle. Cut edges at desired length.